I had a great conversation with some middle school teachers recently. They have been using Kidblog to encourage their students to share ideas, thoughts, and reflections with the rest of the class. It has been working well but one teacher brought up the point that there always seems to be a subset of her students who do not post with any detail or with very much thought behind their words. She has been encouraging them but they have not responded. This has now become a pattern. We brainstormed a bit trying to come up with reasons why students might not willing or able to create well thought out, reflective posts. Thinking about all of this relates, I think, directly back to good pedagogical practice in language arts. 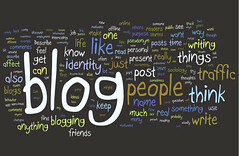 Writing a blog post is simply a different form of writing than what they are used to, perhaps. It might be assumed that a blog would be a more engaging format for students and that might be true for many by not all. A writer who lacks confidence will have difficultly expressing in any form. So, it might be that these students have difficulty writing in any format for any purpose. This feedback about students who are reluctant to post much on their class blog is not that common but I do encounter it from time to time. I think that sometimes educators assume that all students today are “digital natives” (which they are certainly not; sorry Mr. Prensky) and that just by giving them the right digital environment in which to write will draw out the self-expression that has been so slow in coming on paper. This is by no means the assumption that is always made but I think that situations such as this provide material for professional reflection about how to best develop written self-expression in any medium by students.